A 100% free bully zone where your kids learn how to defend themselves while they have fun. The children may be out of school but in the summer camp they are not out of learning. Martial arts training gives children a chance to keep mind and body activated. (They train 3 hours daily). Part of becoming a martial artist is believing and fighting for yourself. We talk once a week on the importance of not being a bully and not getting bullied. From 7:00 a.m to 6:00 p.m. your child is overseen by certified caring staff. Our goal is safety, fun, and learning. In that order! 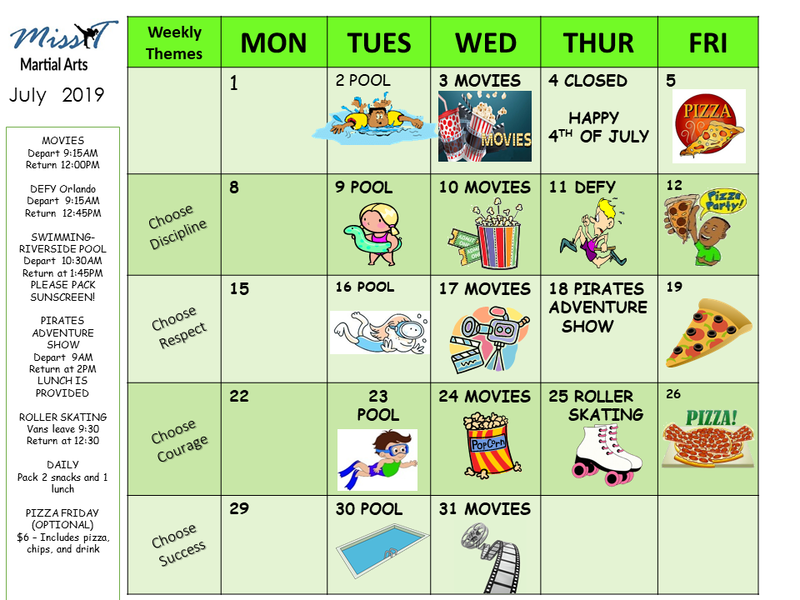 The activities of summer camp are based on 1 single concept. Create young leaders. Best Orlando Summer Camp 2019 is taking Pre-Registrations Now! We have already begun our pre-registration for this year’s amazing Summer Camp! 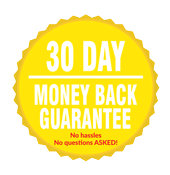 Because you are a valued Family Member, we want to offer you a special deal! 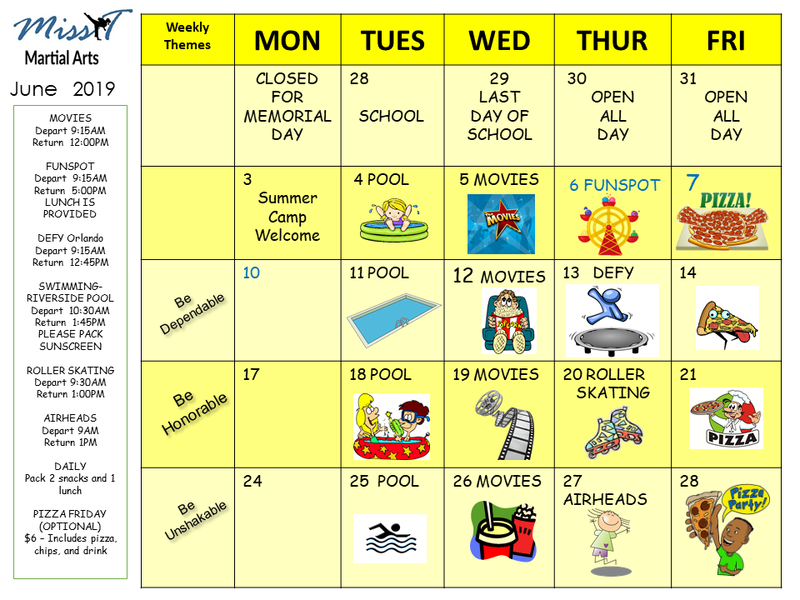 Our Summer Camp includes many fun and exciting field trips: swimming, movies, bowling, roller-skating, Double Down, Pirate Adventure Dinner Show, Defy Orlando, Airheads, and Fun Spot. As you can see, we have quite a line up of fun this summer! The core of our successful Summer Camp is, of course, our daily martial arts class. 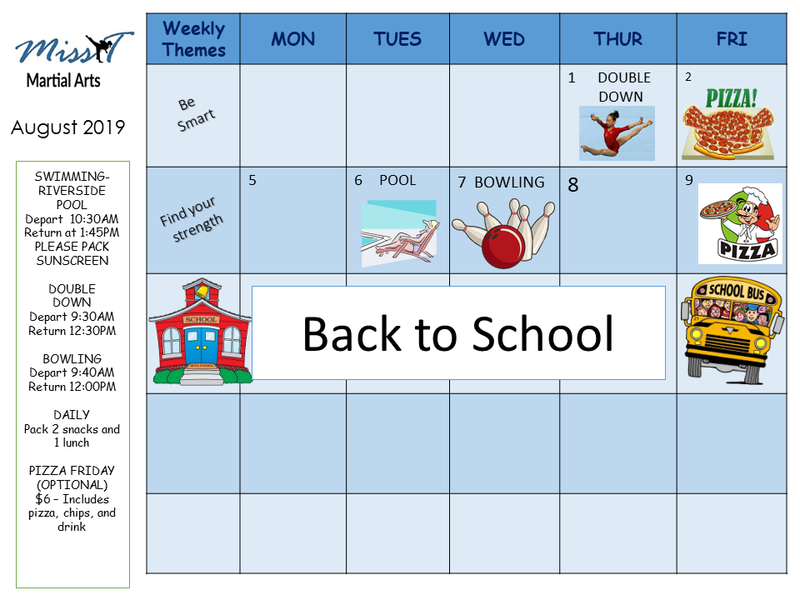 The kids will have two phenomenal classes per day with lots of high energy and fun games. They will build leadership skills, self-confidence, and focus, through learning and practicing the martial arts. Come now and join us for the best summer camp in the Orlando area. Schedule a meeting with one of our staff to register your child in the fun filled summer camp. JOIN NOW! Drop off is 7:00 a.m. – 9:30 a.m. (check field trip schedule for early field trips). Pick up is 5:30 p.m. – 6:00 p.m.
We offer multiple sibling discounts. Registration fee is nonrefundable.